Scottish National Party (SNP) leader Nicola Sturgeon said a British government without Scottish representation would be illegitimate, as she ramped up strategic demands for a post-election coalition with Labour. Speaking at a rally in the market town of Dumfries, southwest Scotland, the SNP chief warned it would be unjust for the next government to be made up exclusively of English MPs. Addressing crowds gathered at a campaign meeting on Monday, Sturgeon said the “test of legitimacy” that applies to the next government cannot simply be discerned by scale and historical traction. “The test that must be applied is whether a government can build a majority and win support that reflects the whole of the UK,” she said. 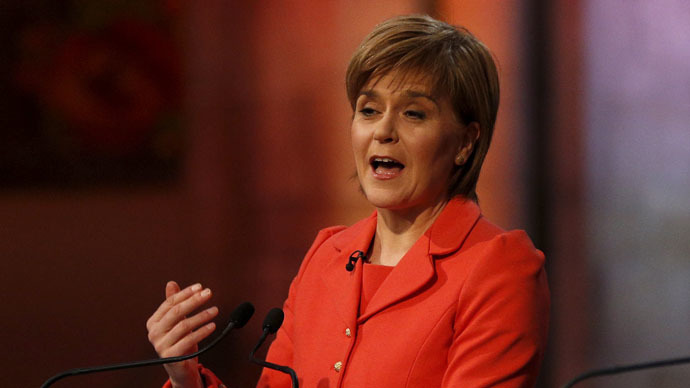 Sturgeon acknowledged that English MPs will inevitably occupy the most seats in Westminster. But she warned a parliament that fails to include “Scottish voices” would be ultimately wrong. With the SNP poised to win a majority of Scotland’s 59 seats and assume the mantle of third-largest party in the UK, Sturgeon said she intends to increase pressure on Labour chief Ed Miliband to form an anti-Conservative Party alliance with her after May 7. Reflecting on her comments, Deputy First Minister of Scotland John Swinney said Sturgeon was driving home the need for the next government to represent the entire United Kingdom. In the event a hung parliament occurs on Thursday, Swinney said it is important to consider how a government that enjoys support across the UK can command a majority in Britain’s House of Commons. “The government that is formed has to command to a majority in the House of Commons … And it is important when that government is comprised that it is supported throughout the United Kingdom and it has political legitimacy throughout the United Kingdom,” he added. Swinney argued the Tories had a single parliamentary seat in Scotland during the last parliament and current opinion polls predict they will have none at all after May 7. He said a truly legitimate government would be representative of all of the UK’s leading political parties. Nevertheless, Sturgeon’s plans to form an anti-Tory, anti-austerity bloc in Westminster capable of shaking up political flatlands in Britain remains resolute. The SNP leader plans to call upon Labour in the immediate aftermath of the general election to form an alliance with her party by voting against any Conservative attempt to form a minority or coalition government. “If there is an anti-Tory majority on Friday morning, we will call on Labour – even if it is not the largest party – to vote with us to keep the Tories out,” she said. Sturgeon’s ultimatum marks a direct challenge to Ed Miliband, after he ruled out the prospect of a Labour-SNP coalition last week. It follows a warning issued by Sturgeon’s deputy, Stewart Hosie, that the SNP may well push for a fresh independence referendum if Labour fails to acquiesce to its economic policy demands.